About mei am a part-time clerk at a public library. 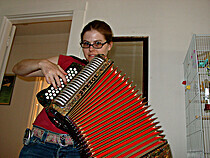 in my free time i keep house, do graphic design (album cover artwork, web site design) and play the accordion. About my libraryafter many moves, i have decided to stop collecting books. they are just too heavy! and, really it is a shame to just let them sit on shelves collecting dust. i have developed a new money and space saving system: now my library is the local public library. i got a job there and work as a circulation clerk and in doing so, i am exposed to many books. often a book will pique my interest or a coworker will recommend something and i end up checking it out and taking it home. sometimes friends give me books to read or recommend things they think i would like. some of the books are great, and some i would rather not even list here.